What a book! The book thief by Markus Zusak is a story of a 9 nine year old girl Liesel in Germany during the time of World War II. Strangely the book is narrated by ‘death’. Initially it sounds a bit strange and creepy to see the world from the eyes of death whose job is to collect the souls of the dead. This is what it had been doing since forever. It is tired of doing so and wants a break. But then there is no substitute of death. The story is about Liesel who is abandoned by her parents to a foster family as they are unable to take care of their children. On the way Liesel watches her brother die and this memory haunts her for a long time. Her foster mother is a short tempered, talkative woman. There is a very beautiful relationship between her foster father and her. He patiently teaches her to read and write, which plays a major role in her life ahead. He is like a pillar of strength and support for her. She is friends with a neighbourhood boy Rudy and they have great times together. Numerous happenings of her life are described like.. Her school life. Football games in the evenings. Helping her Mama in the daily chores. And food of her life – reading. Sometimes the story seems so normal just like a regular day.. But then suddenly there is bombing and war. Probably that’s how even our life is… most of the part is routine life filled with happy and sad times in between.. The main thing which keeps Liesel sane in difficult times is her love for books. Papa teaches her to read and write initially. The progress is slow. But Liesel loves reading and very soon picks up. Together they read the same book multiple times every night. Her passion for reading is so strong that she starts stealing books and is thus called a book thief. Later on she writes her own story in the form of book which ultimately saves her life during WWII. This book shows the power of words on individuals and masses. The book is about 550 pages. All the charecters are describes so well that they almost come to life in our minds. There is not much of suspense as readers can foresee some of the events (mainly deaths). Still the overall story builds up nicely. I would recommend reading it in a day or two to get the complete feel of the narration. It will make one think about life, death, friendship, love, challenges, hardships, inspirations and much more. More importantly how to find and then hold on to ray of hope in grim times. How many times have you read a non-fiction book and you were left amazed with reality ? 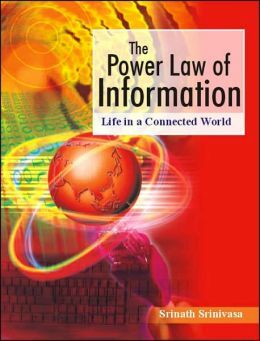 Well, “The Power Law of Information” is one of those books. We are all so busy with the day-to-day happenings in our life that sometimes we fail to see how some things affect us so powerfully and literally change our lives. One of those things is “information”. 2.7 Zetabytes of data exists in the digital universe today and it is growing at a very fast rate. Earlier information was not available so easily and effortlessly. But today the easy availability of information has transformed our lives. This book shows how the huge availability (and sometimes the unavailability) of information affects us in different ways. Earlier it was believed that information networks are similar to physical or material networks. However it is clearly shown here that information networks have unique and different properties like information can be reused, it can be easily replicated etc which are not found in the material network. Information follows the power law, i.e. a small number of entities have a high value and a large number of entities have a small value. It is such a unique and important property that it has its place in the title of the book. Information networks are non-linear since people in the network interact with each other and may be connected in loops. It is also friction-less since the feedback fully affects the information network. Studying and predicting outcomes in such networks can be extremely complex but that’s the way reality is ! In this book, ‘information’ has been analyzed from all the perspectives. Firstly information itself and its properties and how it affects us is discussed. Various parameters which affect information and different ways to model information are studied. Also how we as humans can make beneficial use of this information despite our fallacies, biases and bounded rationality makes an interesting read. Other social factors like herd mentality and satisficing behavior are analyzed with some interesting examples. Money is also in some sense, information. The book concludes on the topic how money affects the world. There is a detailed bibliography and further reading for the interested readers. Overall it’s an amazing book filled with lots of practical examples and a great read over the weekend. Half a Rupee Stories is a book written by Gulzar and translated by Sunjoy Shekhar. If you have ever heard a song written by Gulzar then i am sure you must be his fan ! He is a world renowned poet, lyricist and director. The language used by him is simple and easy to understand and most of all it has the power to touch the heart. Half a Rupee Stories is a collection of 25 short stories. I will say that it is a collection of 25 gems. Each story touches the heart and leaves a message for the soul. It has real life lessons learned after years of experience. Some stories are filled with suspense and thrill while others highlight the various issues faced in life in a unique way. It has real life stories of Javed Akthar (his nick-name is Jaadu :)), Sahir Ludhianvi and Kuldip Nayyar. Many locations of the stories are located around the border regions. There are also some stories of Mumbai. The best thing which i liked about this book is that it shows us how to find a bigger and higher meaning from our daily experiences. It shows how to look at life from a broader perspective. Thus i will say that this book is a must-read ! A story based of faith, trust and miracle. How 100 rupees changed someone’s life ! A story of slum for the perspective of the people living there. A boat-cleaner can also be a king. A glimpse of the life of the people who live on the footpath. All for a ram fight ! Hilsa fish and the newspaper headline. How wars affect lives and souls ! Love story between a bird and a kite. But it was worth the wait. It is an awesome book. Ayn Rand the author has described all the characters of the book to such a minute detail that they literally come alive in front of the eyes. It is a 1943 novel but almost all the scenarios described in it are valid even today. It is a bestseller and millions of copies have been sold all over the world in many languages. The book is mainly based on the life of two architects who compete, struggle and fight with each other to get success, money and recognition. I specially loved the character of Howard Roark who maintains his individualism till any extent. He gives a speech in the end which is superb. Roark is an example of the type of person, a person should. Thus we can say that he is an ideal. His friend and college mate Peter is the opposite of him. He can fall to any extent to see himself good in others’ eyes. A term which i liked in this regard which has been coined in this book is second-hander i.e. a person who does everything to please others and is nothing by himself. Dominique’s speech in the courtroom again makes an awesome read. It’s a page turner. If you have even have a little bit idea about the Indian mythology then you will surely enjoy it. Otherwise also it is good. Although i don’t judge a book from its cover, but its cover is impressive as the content itself. It very well depicts Lord Shiva with the strong well-built body, Trishul his weapon, his matted tresses, the string of Rudraksh beads on his hand and finally the backdrop of the mountain Kailash across the Mansarovar. It is the story of Lord Shiva. His power, his strength, this courage, his sheer brilliance, everything is clearly portrayed by the author. The best thing that i found about this book is that i could actually visualize the complete narration (mostly i can do it :)). Another good characteristic about this book is that is has every emotion from thrill, love, adventure to suspense in the correct amount. This book shows how a common man “Shiva” inspires and motivates the people and thus becomes their “Mahadev”. People have more trust in him than he has in himself. But he is able to live up to their expectations. The Indus valley civilization has been portrayed in an excellent way in the book. We can easily imagine the perfect society which existed thousands of years before the present day. 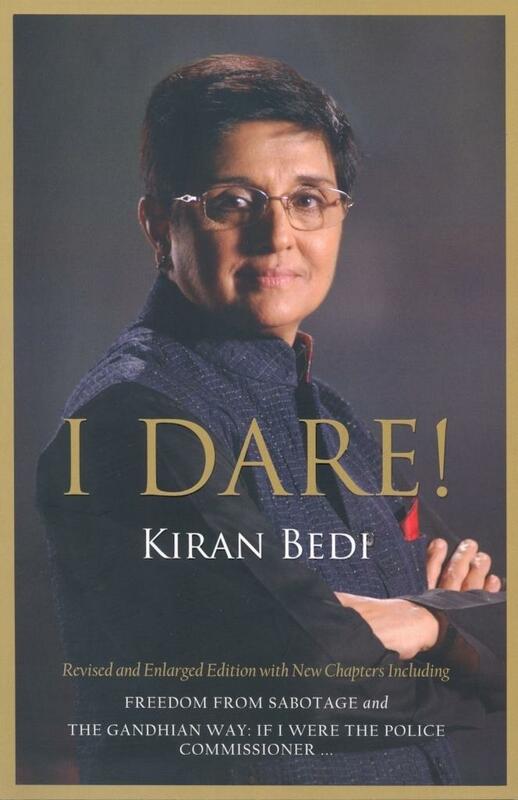 Recently i read I Dare by Kiran Bedi, and i can say that it is one of the most inspiring books (a biography) i have ever read. It is the complete story of the life of the first and highest ranked woman IPS (Indian Police Service) Officer of India. Kiran Bedi is the role model of numerous people. And through this book we can understand how she was able to win the hearts of millions of citizens of the nation. The book begins with the family history of Kiran Bedi. Her parents were much ahead of the times. They sent all their four daughters to the best schools and encouraged them to participate in sports like tennis for their all round development despite the resistance from the elders in their family. Kiran Bedi won many awards in tennis. An important lesson which can be learnt from her is time management. She used to have a fixed schedule and never ever wasted a single moment. All her focus was on her studies and tennis practice. She was the first woman IPS of India and was allocated the Delhi cadre. She lead the Delhi Police Contingent on Republic Day, 1975 and the then PM Smt. Indira Gandhi was impressed and called her for a breakfast meeting. She was impartial and never favoured anyone, whatever their rank or position. She towed the car of the PM which was parked in the no parking zone. She worked in Delhi, Goa, Mizoram and Chandigarh. Everywhere she implemented her unique style of work. Always her main focus and the top most priority was the welfare of the citizens. She devised new ideas and methods to carry out the work effectively and efficiently. Thus she won numerous national and international awards. She always inspired her juniors to fulfill their duties towards the nation by working wholeheartedly. Her work in the Tihar Jail won her the prestigious Magsaysay Award. The jail which was earlier a terrible, frightening place was converted into an Ashram. The prisoners were treated with a human touch. Classes were held by the NGOs where they could new languages, soft skills etc. Festivals of all the religions were celebrated with same fervor. Smoking was banned and thus the health of the prisoners improved. All this happened in a short duration and was possible due to the efforts put in by Kiran Bedi. She was appointed as the ‘Cop of the World’ at the United Nations. She travelled a lot and grained a global perspective. When she came back she was expected to be appointed as the Police Commissioner. But the people inside always hated her and were jealous of her. So despite she being the highest and the most deserving candidate for the position, she was not selected for that post. As a result she resigned and took voluntary retirement. But it did not stop her work but rather increased it. Now she works by herself without any pressure from anyone. She has started two foundations Navjyoti and India Vision Foundation which are doing some great work for the society. Currently she is an active member of the team Anna which is trying to get the Lokpal Bill passed in India.